The DK-LOK® High Pressure Series has been developed to satisfy customer requests for high pressure application. DK-LOK® MP & HP Fittings and Valves are manufactured from 316 cold-worked stainless steel meeting NACE MR 0175. 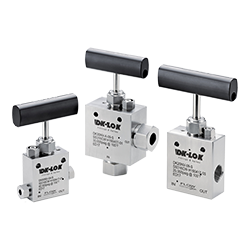 DK-LOK® HP Valves are designed to operate safely and reliably against Medium Pressure for 20,000 psig service and High Pressure for 30,000 through 60,000 psig service and Ultra High Pressure for 100,000 through 150,000 psig service. End connections are cone and thread as well as Female NPT.